This month, April, we will be exploring the number three and how it manifests in Story. It seems that in many tales the number three is an integral part of the telling. For an example in the story of Aladdin’s Lamp, the hero gets three wishes from the Genie. In the story of the Lazy Spinner, she gets three rooms of flax to spin. Often there are three main characters in a story, such as The Three Little Pigs. What is it about the number three that repeatedly shows up in story? The chief symbol of three is the triangle. Other symbols of three are the trident, fleur-de-lis, trigrams, and the trefoil. There are three charities, graces, and sirens. Cerberus is triple-headed; the Chimera has three different animal parts, the head of a goat, a lion, and a serpent. In Christian beliefs, the Magi brought three gifts to baby Jesus. Peter denied Christ three times. There were three crosses at Calvary, and Christ was dead three days before he rose again. There are many divine deities that have triple aspects; Isis, Osiris, and Horus; Brahma, Vishnu, and Shiva; In Christianity there is God the father, Jesus the son and the Holy Spirit. From Japan, there are three Treasures, Mirror, Sword, and Jewel. In Mexico, the Trinity is represented by three crosses, one large cross and two smaller ones. 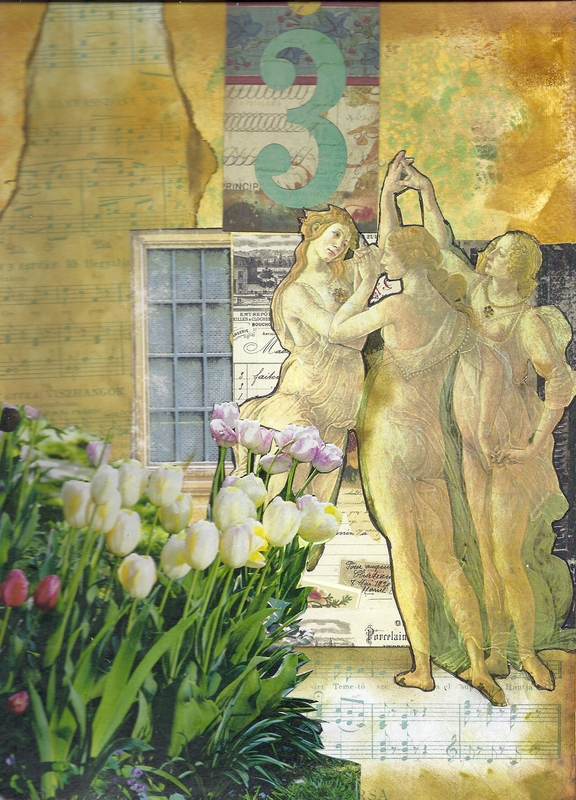 In my collage, “The Three Graces” dance together in celebration of Aphrodite. They celebrate beauty and joy. They bestow beauty, kindness, love tenderness, pleasure, creativity, artistry and sensuality. They dance for the quality greater than faith or hope; they dance for love.